Polynesian dance has long been celebrated as an art form on many islands across the globe. From Hawaii to Tahiti, such choreography has been weaved beautifully into a variety of cultures. A trip to Hawaii is never complete until you have experienced some native dance, and hula is where you'll find it. Now performed at luaus and festivals throughout the islands, this beautiful dance was originally created by the Polynesians who settled in Hawaii. Hula dancers perform to a song or chant, and this is known as a "mele." Oftentimes the choreography acts out the words or emotion behind the mele. 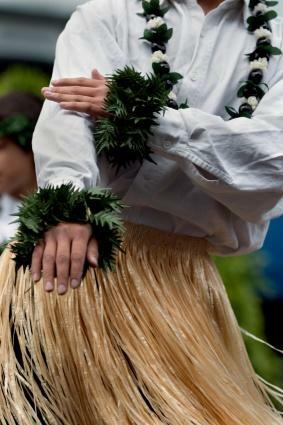 There are two kinds of hula - Monarchy, which is the 19th century derivative of the dance, including western influences, and Ai Kahiko, which translates into ancient style hula. Although the latter was created in the past 200 years, it is a replication of the earliest forms of Polynesian dance. Hawaiians learn hula in many different places, but formal training is done in halau schools. Hula instruments accompany the dance, and these include drums, rattles and rhythm sticks. Sound also sometimes comes from male dancers who wear special dog's tooth anklets. Costuming is also important to the hula, with the simplest of outfits consisting of a wrap skirt and minimalistic top in the same or similar fabric. Lavish grass skirts, intricately assembled jewelry and fresh flowered leis are also commonly seen. Those hula dancers which represent a religious practice or other cultural tradition may have a different wardrobe ensemble. Hula has managed to keep an aura of mystery about it, despite the fact it has become so mainstream. Visitors to the Hawaiian islands continue to be enraptured with this centuries-old dance style, and young Hawaii natives are being schooled in its ancient forms. Even if you don't live in Hawaii, you can still learn Polynesian dance in a variety of places. First, see if your city offers any hula or Tahitian dance classes. Oftentimes special interest groups will host these, or even a local dance studio will put such a course on their schedule if they happen to have an instructor who specializes in such an art form. You can go through the yellow pages or do a Google search to find if a class is offered in your area. Sometimes community colleges are a great resource as well. Secondly, there are videos and DVDs available, which will teach you the basics of Polynesian dance. You will also learn background of the culture when trying out a specific dance style. Children can also be in the know with great lines of videos such as Fitness Beginnings. Finally, some websites are able to teach you basic steps, and YouTube is a great place to start. If you are looking for some choreography, you can get inspired on this video website, which contains countless Polynesian dance classes and performances. So you've learned some great moves and now you are wondering where to show them off. Consider throwing a backyard luau if the weather is cooperative. Here you can have an impromptu hula lesson for friends and family, or have a small, informal performance as part of your party entertainment. If you are involved with some sort of non-profit, you can hold hula lessons or a Polynesian dance performance as a unique fundraiser. Especially during the summer months, this can be extremely successful. If you do decide to perform your Polynesian dance, make sure to have proper costuming. You can purchase a variety of brightly colored Hawaiian fabrics through your local craft store, or by surfing the Internet for some great deals. You will also want to check out your local party store for leis, coconuts and anything else that can add to a feeling of authenticity. Try to stay as true to your dance's cultural roots as possible, and be sure to share with your guests any background or history, including the words to a specific song if your dance tells a story. With your knowledge of Polynesian dance, you can escape to the islands anytime you want to, without spending a dime.